Use PureBlu Hoechst 33342 Dye for routine nuclear staining in Cell Imaging applications and Fluorescence Microscopy. It is available as a ready-to-reconstitute, highly pure powder form, with only one dilution step required to obtain a ready-to-use solution. Hoechst 33342 is a well-characterized blue-emitting fluorescent compound widely used for nuclear staining. As a DNA minor groove binding compound, it can permeate cell membranes therefore preferentially stain nuclei (Figure 1). Figure 1. Hoechst 33342 (in blue) binding dsDNA. The excitation and emission wavelength of PureBlu Hoechst 33342 Dye when bound to double stranded DNA are shown in Fig 2. 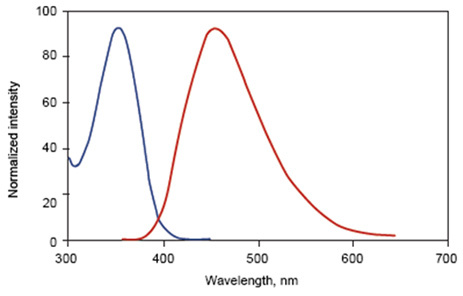 The Stokes shift between excitation and emission wavelengths is large making it an excellent choice for nuclear counterstaining in Immunofluorescence Microscopy, especially when spectral separation is required to reduce fluorescence overlap. Use PureBlu Hoechst 33342 Nuclear Staining Dye with fixed and unfixed cells. It has increased permeability toward intact cell membranes when compared to DAPI and therefore is preferred when using unfixed samples.